Real - Time Data for the Growing Business. Assess your business to increase your productivity. Bill4Time offers comprehensive reporting so you can better manage your business. Easily know your firms financial performance and identify trends to achieve success. Review payment history, balance due, collections, expenses, productivity, summary reports and more. Easily export data as a PDF or CSV for additional analysis. Quickly access all accounting activity, outstanding balances, work-in-progress and aging reports. Identify collections gaps and issues. Show time, expenses, file uploads and note entries. Run historical activity of trust accounts. Calculate time and expenses by user, client or project. Access time entries and expenses within specific time frames or aggregate with just a click. View organization productivity month over month, year over year. Understand which projects/matters are consuming the most time. Learn which team members are bringing in the most business. Better align compensation based on new revenue generated. Multiple reports including: user efficiency, expense, schedule and internal tracked time. 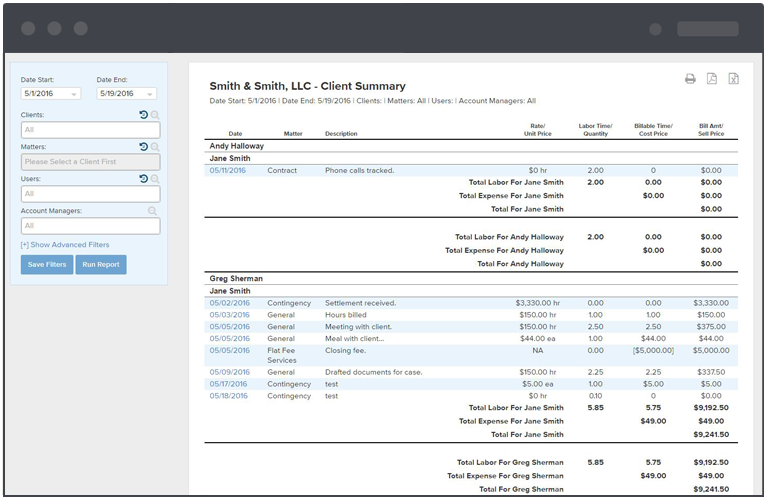 Examine billable and nonbillable time to gain greater efficiencies and streamline workflows.